Singapore’s first art park, the Youth Olympic Park, sets the stage for the Youth Olympic Games! As the nation eagerly anticipates the inaugural Youth Olympic Games 2010 (YOG) in August, the Youth Olympic Park sets the stage for Marina Bay, the spectacular venue where the YOG will open. This will be the bridging point to converge the Olympic Values of Excellence, Friendship and Respect amongst youths all over the world. Connecting the Youth Olympic Park to the Marina Bay landscape would be ‘The Helix’ and ‘The Bayfront Bridge’, another key area for the YOG, where sports and cultural activities will be held. The Youth Olympic Park features 27 winning artworks by youths. The artwork, curated 4 years in the making since 2006, were chosen from the competition organised by The Urban Redevelopment Authority (URA); “Leaving Your Creative Imprint on Singapore’s Landmark Bridge”, based on the theme “Aspirations for Life in Singapore”. UrbanWire uncovers the story behind the art on the rock wall at the Youth Olympic Park. 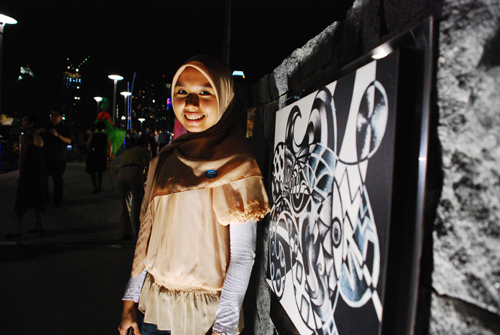 Fathin Atikah, whose artwork is exhibited, and who was then a Bukit View Secondary School student in 2006, feels “proud of (her) achievement and honoured that (her) artwork will be there on permanent display.” Cheak Yen Hui, another student artist, said that this bridge is special to Singapore because it represents our future, since the artworks on the landmark also cultivate a heightened sense of belonging to our homeland. Mdm Maziyan Abdullah, Head of Aesthetics and Design of Bukit View Secondary School is just as excited as her students, “It’s a breakthrough to have their aspirations mentored by Singapore’s art practioners,” she expressed. Mr Bernard Chan, a senior architect from the URA, tells UrbanWire about engaging the teachers and youths of Singapore in the competition. “These lucky young artists were able to collaborate with teachers and were mentored by industry professionals.” Said Mr Chan, who is also from the Deparment of Conservation and Urban Design in the URA. Spectators at the official opening of the bridges and the Youth Olympic Park on 24 Apr were treated to a myriad of colours – a dazzling 2 minute display of pyrotechnics, as well as performances along the bridge – against the backdrop of the Marina Bay Skyline. Mr Aaron Khek, the chief choreographer for the opening and closing ceremonies of the Singapore Youth Olympic Games, specially choreographed the music and dance extravaganza. Highlights of the explosive performances included a fan dance, beats by the Tenko Drums and music by The TENG Company. Mr Anthony Kang, President of the Association of Accredited Advertising Agents Singapore (4As) and the President of Dentsu, Singapore, was very impressed by the spectacular opening. “This is a historical moment for Singapore,” he said. “The unique landmark has an apt name because the instrumental design connects people. 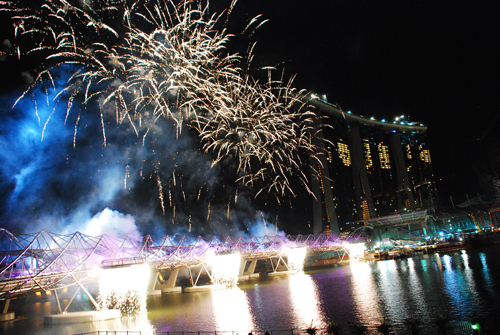 It sets the tone for the whole Marina Bay, for our future,” said Mr Kang, one of the ambassador’s for Youth Development. The Helix, shaped in a double-helix DNA structure, will connect the Marina Bay Sands to the Esplanade. 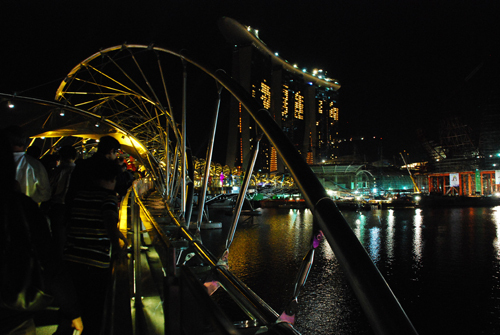 Parallel to ‘The Helix’ is the ‘The Bayfront Bridge’, a vehicular bridge that is part of Bayfront Avenue and situated near the Marina Bay Sands Integrated Resort. The bridges were named after the top choices from the Public Naming Exercise conducted by the Urban Redevelopment Authority (URA). Amongst the things that we can look forward to on ‘The Helix’ would be the ‘Friendship Wall’, which will bear photographs of the young athletes from YOG taken by Singaporean youths. YOG Wants You To Go Green!